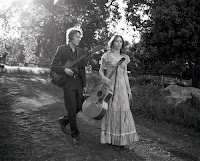 Gillian Welch has announced tour dates, see below. She and longtime partner David Rawlings will tour through the fall. She'll be in New York on Saturday, October 22 at the Beacon Theatre. There will also be a stop at the famed Newport Folk Festival on Saturday, July 30. The tour winds up in at Ryman Auditorium in Nashville on Thursday, December 1.